The problem with not watching the video feeds from the ROVs at the Deepwater site on a very regular schedule is that it becomes hard to define if anything has changed since the last time you looked. 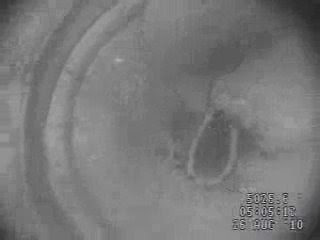 At 11 pm Central tonight, for example, the feed has switched back from the downhole camera to the ROV camera on the Boa Sub C ROV1, and the borehole feed shows that the pipe containing the camera seems to be dangling in the water, as it has been some time ago. So it was not clear from the suggested cameras as to the current status of the fishing attempts to remove the different length of drill pipe (DP) which are still within the BOP and the stack above it. 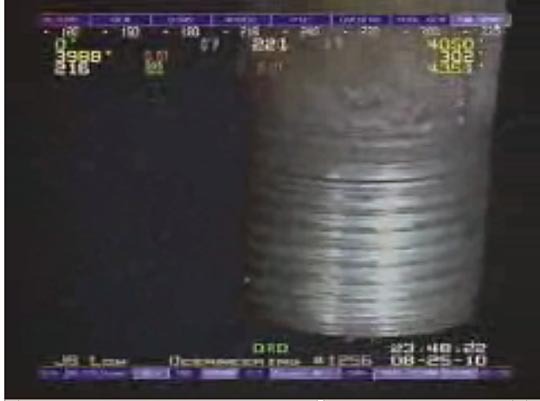 However, switching to the Enterprise ROV1, suddenly there is a piece of pipe being examined. 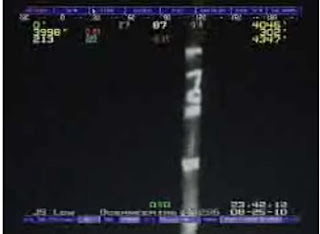 It is difficult to tell exactly which piece it is, though it is apparently marked in what may be foot intervals, but the examination at the moment is focusing on the end of the pipe, which is the male end of a pipe section, and it is hard to determine whether the threads have been damaged or not. (This is being written as this occurs). MoonofA has an explanation (this was part of the fishing string) and I will add that comment below the fold and the current pictures. 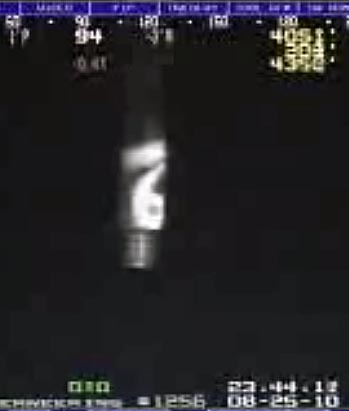 (suggesting the other side of the joint might have carried a 5). The mark just below the point where the pipe section goes into the end of the fishing tool that caught it reads 90, and then there are three individual marks and the fishing tool holding the upper end of the pipe section. So that they could release the top and go and look at it. And it appears, at first, that this was the piece of the pipe that was cut through by the diamond saw that the Admiral referred to in his press briefing.But then they do a close-up of the top and it is the female section of the joint at the other end of the drill pipe. And this too gets a close examination of the threads. Here is a video by RockyP showing the lost part standing vertically in the mud. But the Discoverer Enterprise has two derricks and the other derrick had another pipe down with a fishing tool and with a cam inside it. 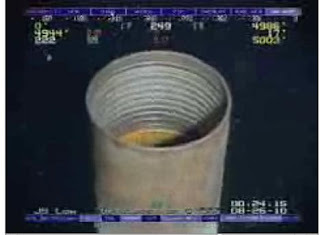 That pipe went down and looked for "fish" inside the stack: Video by Naula. 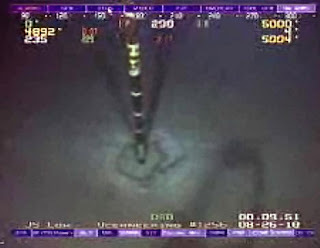 The first fish found at a depth of 5015 feet was the longer piece of broken drillpipe with a squeezed end and they actually tried successfully to get it inside the overshot tool. But when they yanked the tool up the fish escaped: video in double speed by me. 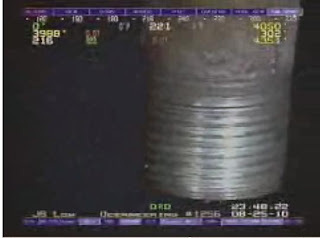 We are seeing the inside of the flex joint from the camera in the fishing tool. There is in the center-right an open piece of pipe. Next to it is some rough space open where fluids come through from below pumped by the Q-4000 through the choke line of the BOP. At the top of the picture another pipe can be seen which extends above. Both pieces are probably held back by what appear to be hydrates (though this could be just loose "beehives" of hydrates or something else). Hard hydrates would explains why the first attempt to yank the longer caught fish did not work. It is probably held back by hydrates on its lower end. The fishing trip has ended for now. The big question to us at #theoildrum is: How did hydrates form so deep inside of the stack? When was there seawater as well as methane, both needed to form these hydrates, in the BOP and stack at the same time? Or do we see something different than we think? Heading Out comment - they did remove some of the hydrates using a high-pressure jet earlier in the work, and this should still be down there, so they may go in with a lance to clean out the hydrates, but if they exist throughout the lower BOP then the entire assembly may be frozen in place, and if this extends down into the casing of the well, then as I mentioned in an earlier post, trying to pull up the drill pipe, and even recover the BOP may be halted because they will snap the drill pipe before they will be able to break it loose. Alternately they could try flooding the area with chemicals again. Earlier in the day Admiral Allen explained some of the events that I discussed in yesterday’s post, noting that the rams in the stack had become jammed because of the formation of hydrates within the mechanism, that then led to them freezing as the hydrates were disturbed. BP then chose to flush the system again, using an antifreeze solution. Question: What chemicals were used in the recent flush to remove hydrates? A. BP used a methanol soak as the predominant medium for melting the hydrates. They also circulated MEG water - methyl ethylene glycol (antifreeze) - to help improve visibility conditions. Q. Will there be ROV feeds available to observe the pipe removal? A. BP will have the regular suite of ROV's on scene for the operation and the pipe extraction should be visible through the Enterprise ROV camera. With the problem of the ram movement in the capping stack having been resolved, the plan for the day was to go down inside the stack to recover the pieces of pipe that had been found. One of these is relatively short (about 18-inches long) the second (and here the Admiral corrected a length given earlier) is some 13-ft long, and then there is the section of the DP itself. Now the segment that appears to have just been removed would be 30-ft long if it were a standard length of DP, so I am wondering if this was a transcription error in the relevant paragraph of the teleconference? Unfortunately, not having watched earlier this evening I missed the section of pipe falling off, and what led to the sequence of events i described above, where the two ends of the pipe being examined were, in fact, at one time joined together, rather than being the one section of drill pipe that I had initially thought that they were.